Can’t wait for Rogue One? Still can’t get over “that scene” in The Force Awakens? Or do you think you can beat Kylo Ren no matter how powerful he is? Whatever Star Wars fix you’re looking for, we’ve got the board game that’s perfect for you (and your equally-thirsty friends and family). Peculiar characters from another galaxy or another planet, a newly-discovered spot in a vast universe, aliens interacting with ordinary human beings, or robots dominating over earthlings—these are just a few of the familiar things we read on sci-fi books and watch on movies. However, nothing beats the many plot twists of the classic, all-time favorite of sci-fi enthusiasts—Star Wars. Star Wars, a film series created by George Lucas, has been around for quite some decades. Because of the massive support it gained from fans worldwide, it became one of the highest-grossing film series and most successful media franchise. Books, TV series, as well as computer games and comic series continue to flood the market, finding their way to every fan’s collection. With all the thrill, drama, suspense and a little bit of everything, including political science, you might be one of the people who wish to experience the fun of playing a Star Wars RPG board game along with your pals. Last update on 2019-04-21 at 09:07 Product prices and availability are accurate as of the date/time indicated and are subject to change. Any price and availability information displayed on [relevant Amazon Site(s), as applicable] at the time of purchase will apply to the purchase of this product. 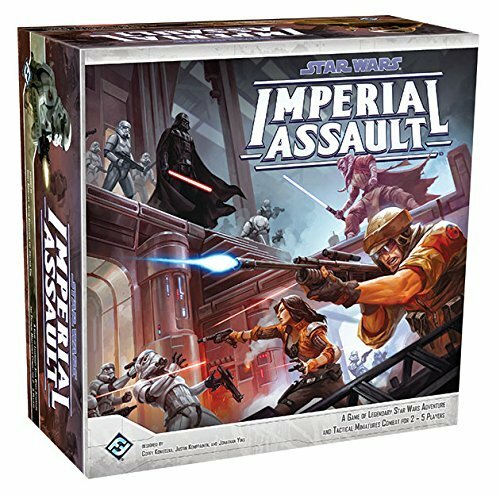 Everyone looking for a game filled with thrill and adventure may possibly end up putting Star Wars: Imperial Assault on top of the list. In this RPG game, two to five players enter and engage in galactic missions, playing the roles of the characters of either the Empire or rebellion. For 60 to 120 minutes, apply your tactics on either a campaign game or a skirmish game. The campaign and skirmish games are the two game options that allow players to choose how they want to play Star Wars: Imperial Assault. If the players choose the campaign game, one player should act as the character leading and commanding the troops of the Galactic Empire, aiming to destroy the Rebel Alliance. Meanwhile, a maximum of four other players act as the defenders of the Rebel Alliance. They engage in top secret tactics to defend their troop against the Empire, enforcing strategies that will ruin the opponent’s schemes that were plotted against them. The second option which is the skirmish game is best for two players. You and the other player are pitted against each other in a tactical combat game. Both players organize and lead each team’s imperials, rebels, and mercenaries, and collect a deck of command cards that may determine the troop’s victory or failure. It was in the year 2000 when the Wizards of the Coast (WotC) published this mini RPG game. 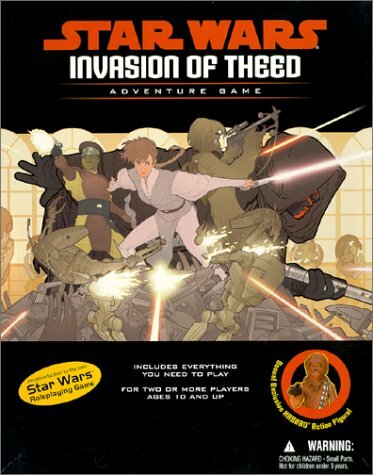 Dubbed as one of the most fun and most interactive RPG games than any other video game, Star Wars: The Invasion of T﻿﻿h﻿eed ﻿﻿﻿Adventure Game is designed to allow gamers to create their own story, be imaginative, explore the galaxy, and act as a Jedi knight, soldier, or scoundrel. Star Wars: The Invasion of Theed Adventure Game is a boxed set consisting of a guidebook, adventure booklet, character sheets, character tokens, plus an action figure of Rorworr. Ready to take on your new adventure? Call your friends as this game is made to be enjoyed by two or more players. Imagine all you want and invent a unique quest. Anyone dreaming of becoming a pilot even just for a day, should play Star Wars: X-Wing ﻿Miniatures ﻿Game. You can also act as the head pilot every time! 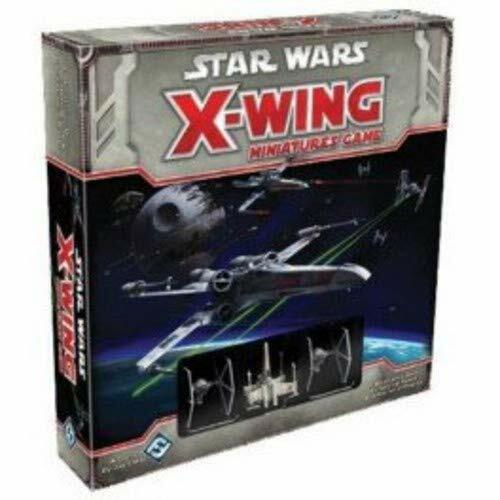 The X-Wing Miniatures Game is the ultimate ship-to-ship tactical combat game for every player who has an inner passion for aviation adventures. Though the X-Wing Miniatures Game is suggested for up to four players, it is best played by two players. In this game, each player is tasked to become the squad leader of either the Imperial or Rebel pilots, taking full control over space ships combatting against each other’s team. As the squad leader commanding your space pilots, you need to think, create, and establish strategic plans to win the game. This is why the smartest and most tactical pilot will always conquer the fight. Rules of the game are easy to learn and apply even for first-timers with ages 14 and up. Perfect for: Anyone who wants his or her own X-wing. Gamers describe Armada as something very much alike with the X-Wing Miniatures game. In Star ﻿﻿Wars﻿﻿: Armada, two players act as the fleet admiral of either the Imperial Navy or the Rebel Alliance. The difference between Armada and X-Wing Miniatures Game is that the former is a much more strategic game than the latter. In the X-Wing Miniatures Game, players have the chance to react and act based on the actions of each other’s troop at every turn, while in Armada, you don’t have much of that chance. It is described as a more exciting, yet more challenging game which compels players to become more imaginative and apply foresight when making plans for the squad’s best interests. So, failure to plan ahead for the threats that are sure to come will mean loss. This is why before you actually begin and launch your ships in the vast Star Wars universe. You need to learn the secret of getting to know all of your ships more extensively than just familiarizing yourself with the rules and the components of the set. Each Armada set consists of pre-painted miniatures, maneuver tool, custom dice, and tiny dials. 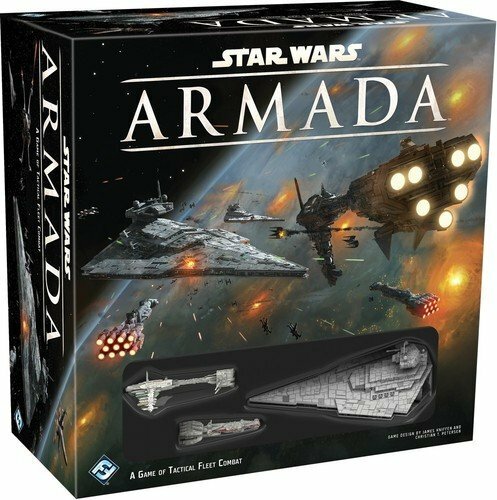 What’s more fun, Armada is designed the fulfill every Star Wars collector’s dream as the game may require players to get more collectible components as they become available over time. The game is a bit harder than what you expect, and may require a lot of free time to master your schemes. The games listed at the top are specially designed for older kids. Well, who says that eight year-olds can’t possibly enjoy an action-filled Star Wars board game fit for their age? Thanks to Star Wars: Epic Duels, it’s possible to enjoy a less complicated yet awesome RPG board game because this is designed for kids with ages eight year-old and up. It’s best for two to six players. There are 12 major Star Wars characters in the game accompanied by other minor characters. As a player, your goal is to defeat your opponent by destroying all of his characters. Each set of characters has its own card deck. It’s easy to determine when a character can be destroyed through the information on the character’s card. Players may also set the battle on different battlefields such as the Geonosis, Emperor’s Throne Room, Carbon- Freezing Room, and a landing platform. During the game, each player has his own turn to roll the dice and move his characters and do an action by drawing or playing a card or healing a character. Still can’t get over the final scenes of the Star Wars Episode VI: Return of the Jedi? Now, this is definitely the game for you. Star Wars Risk allows players to relive these final scenes, letting them experience the tactical missions and battles set in the Star Wars universe. In the Star Wars Risk game, there are three distinct battles happening on the game board simultaneously. These are the attack on the Death Star, the shield assault, and the clash of Luke Skywalker and Darth Vader. Star Wars Risk is designed for kids ages 10 and up. It is recommended for two players, or for two teams composed by two players each. The game usually lasts within 45 to 60 minutes. You can choose to play for the Empire or the Rebel Alliance. Your goal in the game depends on which troop you’re playing for. If you are playing as the Empire, your ultimate mission is to wipe out all of the Rebel fleet. On the other hand, if you are on the Rebel Alliance’s side, you must destruct the Death Star. The first to complete his own mission will apparently win the game. 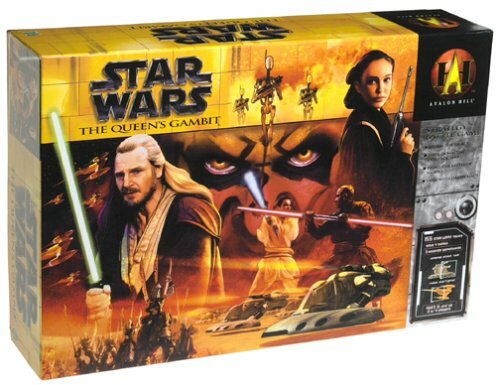 Like any other typical RPG board game, your mission in the Star Wars: The Queen’s Gambit game is to finish off your opponent’s force. It is based on the scenes of the climactic war of Star Wars: The Phantom Menace. In this game, players are required to keep a keen eye on four battle arenas as all battles happen simultaneously during the gameplay. The four battle areas in The Queen’s Gambit remind us of Star Wars Risk as the two games are similar with each other. Failure to divide your attention as equally as possible on the four areas of battle will likely lead to the destruction of your force, hence your loss. The four battle areas are The Plains of Naboo, The Space Battle, The Reactor Control Room and The Palace. What do you get in the Star Wars: The Queen’s Gambit set? Well, you have over 150 miniatures representing various Star Wars characters, card decks that will help you determine your actions in every turn, a classic dice, two main boards, and the coolest part—the three-level 3D palace. You can also conclude that this game is designed for the dice rolling-obsessed players because The Queen’s Gambit requires you to do a lot of that in each turn. But that’s not all. Decision-making might also be tough at times. The concept of this game revolves on three phases of play: planning, action, and draw. 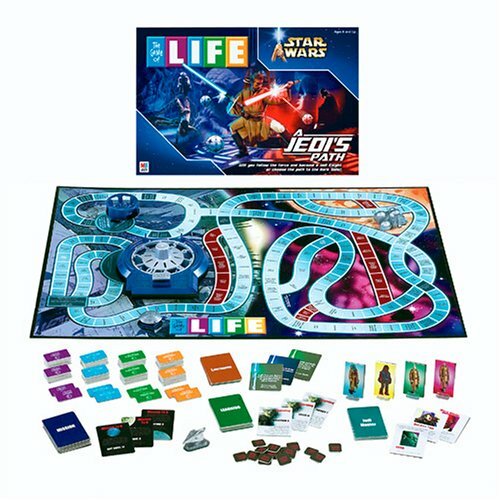 The Game of Life: A Jedi’s Path is basically the Star Wars version of a classic board game The Game of Life or Life invented by Milton Bradley. The Game of Life has been dubbed as the first popular parlor game in America. Meanwhile, the Star Wars version which is The Game of Life: A Jedi’s Path aims to determine which player could be the winning Jedi knight. In the game, two to four players will be challenged to become either a Jedi warrior or a Sith Lord, passing tests, battles, and missions, learning lessons, and building lightsabers. The gameplay also includes building connection with the Force through Logic, Intuition, Fighting, and Energy. To end the game, the strongest Jedi knight who has withstood the fight will battle against the fiercest Sith to determine the ultimate winner of the game. Now here’s an exciting game for children 5 years of age and above. 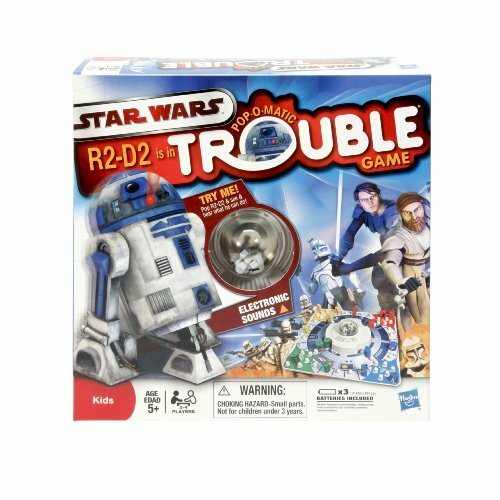 Your ultimate mission is to save your favorite droid R2-D2 from trouble by guiding Anakin Skywalker and C3PO around the board. The game is typically a race around the board. Each player is given four game pieces of the same color. The first player who successfully moves all of his pieces around the “Home” space will be the winner of the game. If you think this is a typical dice rolling game, well, it’s a bit unique than any other board games. You don’t have to roll the dice in each turn because the awesome Pop-O-Matic dice roller will do the honor for you to keep you from the classic dilemma of lost dices. Everyone will surely love the simplicity of this game--not just five year-olds, but also the whole family. The market offers tons of RPG games for Star Wars enthusiasts. Each RPG game is designed for every kind of player to fulfill his wants and let him have fun in his own unique way. As a gamer, you need to carefully choose which game suits your age, interests, and abilities so you can fully experience the fun and thrill of a virtual Star Wars adventure. For the more advanced players who have been used to RPG tactical board games, Imperial Assault, X-Wing Miniatures Game, and Armada are the ones for you. On the other hand, the Invasion of Theed Adventure Game suits highly imaginative players who wish to create their own story in the game. Avid multitaskers might as well choose Star Wars Risk and The Queen’s Gambit. Jedi knight wannabes, why not try The Game of Life: A Jedi’s Path? 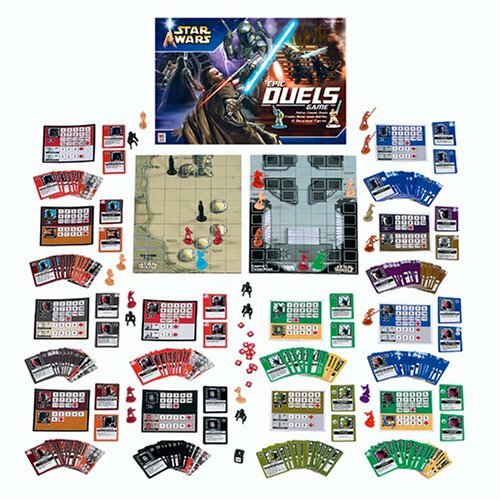 Last but not the least, Star Wars: Epic Duels and Star Wars R2-D2 is in Trouble board game will be perfect for kids who are five to nine year-olds and for the whole family as well. Now that you have all these ideas in mind, you have every reason to try a Star Wars adventure if you haven’t done it before. Some games might be a little harder and more complicated than the others. But no worries, with all the detailed guides available online and in the boxed sets you purchase, and constant practice, you can be the ultimate Star Wars gamer of all time.